An attractive poster advertising the Union Pacific Railroad in Kansas. The advertisement first appeared in The American Weekly and pictures a farmer plowing the land by hand at sunset. He is looking at the starry sky. 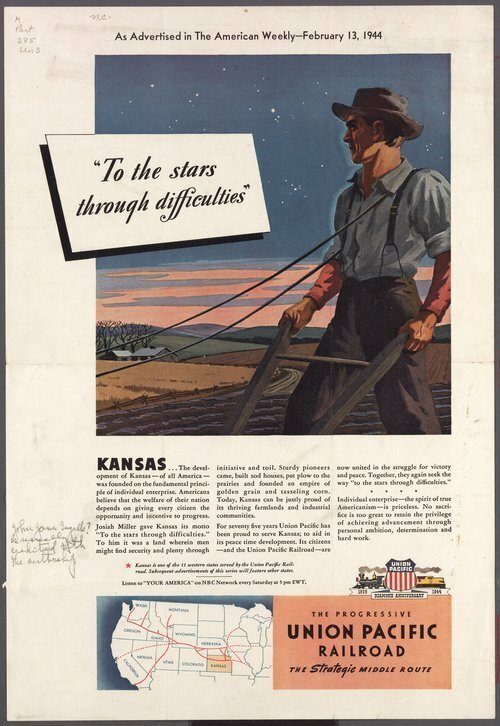 The Kansas State motto "To the stars through difficulties" is emblazoned on the poster. A brief history of the Union Pacific Railroad's contribution to the development of Kansas over the past seventy-five years is noted.